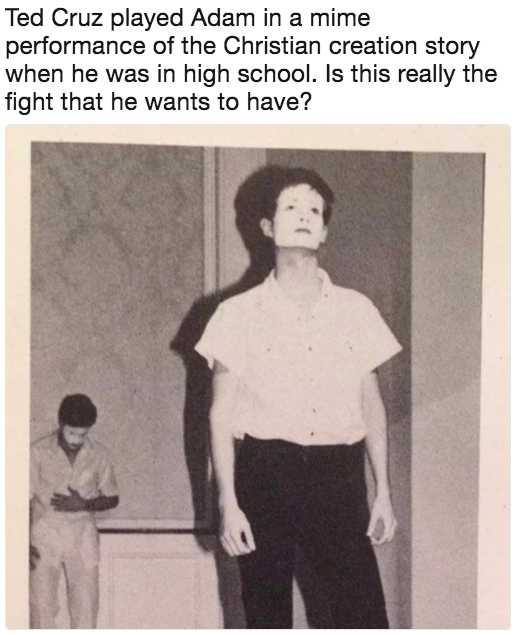 Is this a picture of Ted Cruz as a mime? 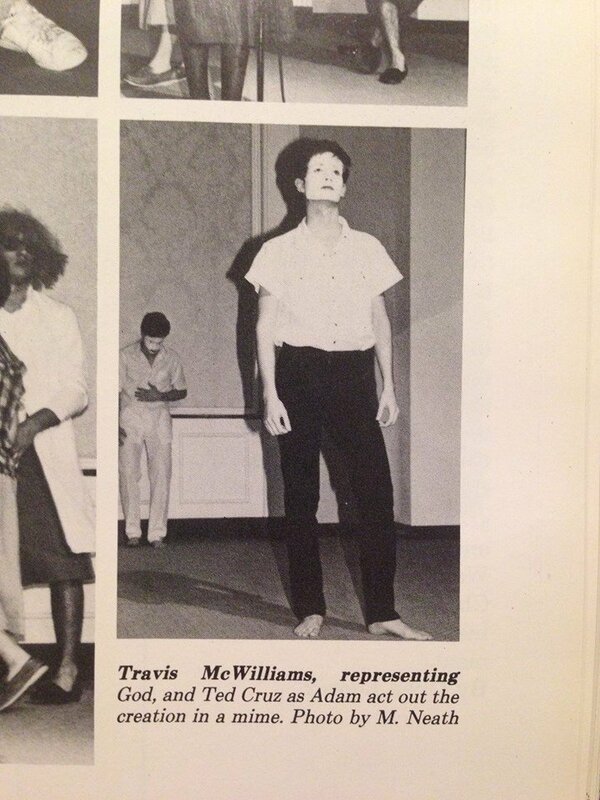 Ted Cruz played Adam in a mime performance of the Christian creation story when he was in high school. Is this really the fight that he wants to have? I've seen this picture now many times. This time I found here, but it seems to be pretty hot on Facebook. Where is this picture from and is it legit? Travis McWilliams, representing God and Ted Cruz as Adam act out the creation in a mime. Photo by M. Neath. “M. Neath,” the person who took the photo, would surely know more. I found a smattering of search results for a Mark Neath, about Cruz’s age, and contacted him via email. Cruz eventually became president of the drama club, so he was definitely involved in theater. Do 33% of high school graduates never read another book for the rest of their lives? Did Rachel Scott draw This Picture? and was the Picture dreamt about? Is this picture of Trump making people swear to vote for him genuine? Is this picture of a man in Colorado Springs nearly being blown away, genuine, or a hoax? Is this phrase attribution to BLM correct? Did Antifa distribute this pamphlet? Is this picture from an abortion clinic dumpster? Is this chart of executive branch criminal prosecutions accurate?